Over 140 different instruments are currently supported. This includes laser trackers, arms, laser radars, scanners, projectors, theodolites, total stations, and photogrammetric devices—all featuring a common interface for each instrument class. Align to a known coordinate system using a variety of techniques, from 3-2-1 and best fits to interactive fitting such as Quick-Align and classic surface fits. Relationship Fitting allows for simultaneous feature-based fitting to organic surfaces in addition to traditional iterative fitting. Maintain a clear history of all data from start to finish with 100% traceability from measurement to reporting. Uncertainty Calculation & USMN calculate measurement uncertainty and use USMN to achieve the ideal instrument network. Digitally assemble components with Relationships and constraints to see how parts will fit in final assembly. An entire suite of tools are available for real-time building. Address ASME standard GD&T requirements with support for native CAD annotations. Take advantage of CAD models to capture deviations over time or watch them in real-time. Quickly and easily generate custom reports with output to a wide variety of formats. Use Measurement Plans and an SDK to enable powerful scripting and automation capabilities. Combine laser scanner interfaces with advanced tools for feature fitting and automatic sphere extraction. 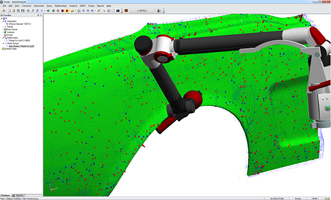 Automatically extract features from scan data for easy comparison to CAD or analysis with GD&T. View real-time 3-DOF and 6-DOF spatial data and control laser trackers remotely from an iPhone®, iPod® touch, or iPad®. Download the official SA Remote app for free at the Apple App store. IGES, STEP, STL, CATIA®, SolidWorks®, NX®, ProEngineer®, Creo Parametric Inventor, and more.